This decade saw the culmination of the Taishô era, but also several developments that eventually led to the outbreak of the Pacific War (1941-1945). At the time, only the most insightful of observers recognized the signs of the time, and at the end of the Taishô era, roughly between 1924 and 1926 there were quite a few developments not pointing in the direction of war: in 1925 universal male suffrage was introduced, quadrupling the number of voters; there was some social legislation, military expenditure was halved, and most astonishing of all was the rapid rebuilding of Tokyo after the Great Kanto Earthquake of September 1st 1923. 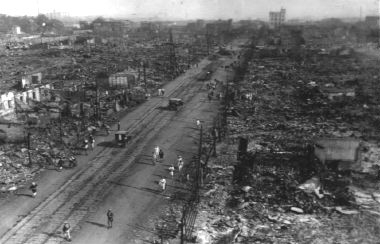 At the time of the earthquake Tokyo was the world’s third largest city, and the earthquake had devastating results: some 100,000 people were killed, approximately 600,000 houses were destroyed or seriously damaged, especially in the Shitamachi (downtown) district. With determined efficiency the reconstruction of the damaged city was undertaken, and in only a few years’ time the most seriously damaged parts had been transformed into a modern city with high concrete buildings. The narikin (nouveaux riches) and the moga, an abbreviation of modan garu (modern girl) created for themselves a background in which they could flourish. Yet there were several flies in the ointment, and clouds gradually started gathering. In 1923 an anarchist had tried to assassinate Regent Hirohito (the Taishô emperor’s son, who had taken over his father’s duties in 1921), in 1924 the US Congress had passed the Immigration Act, which blocked Japanese immigration into the US, and which was the culmination of a distinctly racist attitude in California in particular. In my library I have a book by H. A Millis, The Japanese problem in the United States, published in 1915 “for the Commission on Relations with Japan, under the authority of the Federal Council of the Churches of Christ in America”. It makes very depressive reading. In 1927 there was a banking crisis, and in 1929 the New York Stock Exchange crash exacerbated the worsening economic situation. In 1930 Prime Minister Hamaguchi Osachi (1870-1931) reached agreement with USA and UK to limit naval construction. The rate agreed upon was to be: USA : UK : Japan = 10 : 10 : 7. This led to serious protests all over the country, and an assassination attempt on the PM, which failed. He was seriously wounded however, and died the following year. Also in China the Japanese felt their interests threatened by the Kuomintang, who were proving ever more successful in their attempts to unify the country. For Sôsaku Hanga, the 1920s were a period of consolidation. Several early pioneers like Minami Kunzô and Ishii Hakutei stopped making prints entirely, new stars like Hiratsuka Un’ichi (1895-1997) and Onchi Kôshirô (1891-1955) appeared in the firmament. Both were major artists, though in different ways: Hiratsuka Un’ichi was indefatigable, travelling across the country, teaching everywhere while working on an impressive oeuvre. Onchi Kôshirô was a truly innovative artist, who had an enormous influence on his fellow-artists. He had been born with a gold spoon in his mouth (his father was a tutor of the imperial family, and Onchi Kôshirô himself had had private tutors as well), and after leaving art school (prematurely) he became well-know as a book designer, and most of all as a printmaker. The 1920s are also known for the flowering of a great number of Hanga magazines that appeared and disappeared in the 1920s. Apart from the annual Nihon Sôsaku Hanga Kyôkai exhibitions these magazines were the primary means by which established and aspiring artists alike could reach their audience. Sôsaku hanga prints were made in very limited editions anyway, mainly because most artists saw no use in printing more than a few copies, and even the Hanga magazines had a very limited circulation. The best-known, Hanga, is supposed not to have had more than 300 subscribers, though some prints may have been reprinted later. Hanga is exemplary in many ways. It was started in 1924 by the publisher Yamaguchi Hisayoshi, the owner of Hanga no Ie (House of Prints) in Kobe, the same man who had published Hiratsuka’s “Tokyo after the Earthquake” series. Hanga appeared four times a year. It was not really a magazine, but a folder, and later an envelope containing ten to fifteen prints attached to pieces of thin cardboard giving artist and title. After 16 issues Hanga was discontinued in 1930. Almost all known sôsaku hanga artists contributed prints to this magazine in this period. Another major achievement in the 1920s was the publication of Shin Tokyo Hyakkei - One Hundred views of New Tokyo, by the publisher Nakajima Jûtarô, who had also published the series Nihon Fûkei Hanga mentioned in the previous essay. 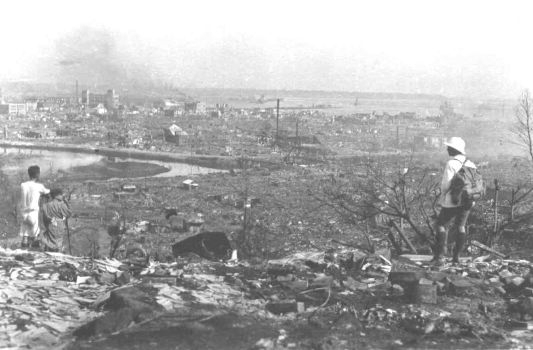 The series was started in 1928, so five years after the Tokyo earthquake, in an edition of 50 numbered copies. It took five years to finish. Contributors to the series were Hiratsuka Un’ichi, Onchi Kôshirô, Maekawa Senpan (1888-1960), Fujimori Shizuo (1891-1943), Henmi Takashi (1895-1944), Kawakami Sumio (1895-1972), Fukazawa Sakuichi (1896-1947) and Suwa Kanenori (1897-1932), so the best artists of the period.